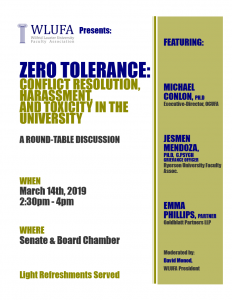 On 14 March, in the Senate and Board Chamber, from 2:30-4:00, WLUFA is hosting a round table discussion on workplace harassment and conflict resolution. Please note that this event will have video conferencing available at the Brantford Campus in room CB100. 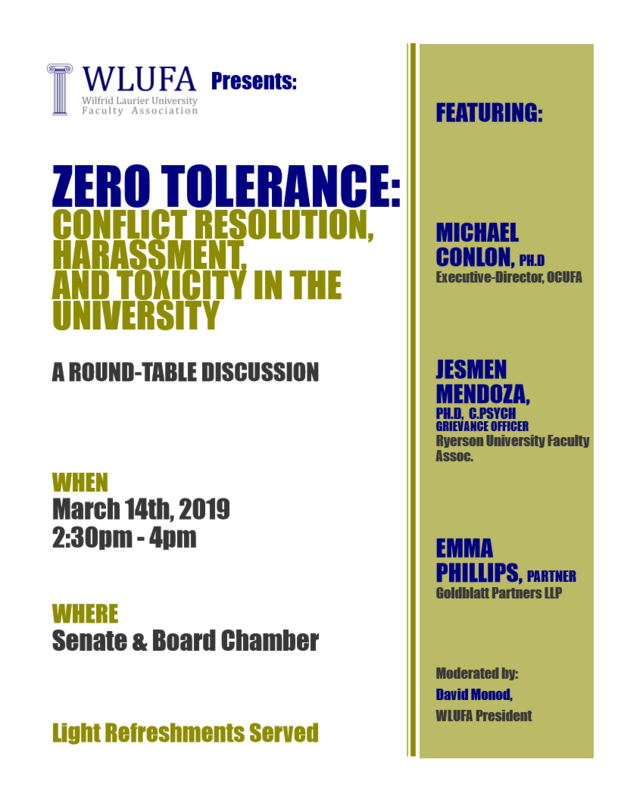 Emma Phillips, from the law firm Goldblatt Partners, will present on the law regarding workplace harassment and will talk about some recent cases; Dr. Jesmen Mendoza, from Ryerson, will offer ideas on how to resolve conflicts before they get out-of-hand; and Dr. Michael Conlon, the Executive Director of OCUFA, and former Director of the British Columbia Federation of Faculty Associations, will talk about best practices when an investigation starts and will draw some lessons from the UBC/Galloway case. After the speakers’ remarks, we’ll open the floor for questions and discussion. Light refreshment will be provided and Linda has arranged for a raffle draw, just in case you need further incentives! None of us know when we might find ourselves involved in a conflict in the workplace and knowledge of university policy, Ontario law, and what to do and not do may prove invaluable. We look forward to seeing you on the 14th!